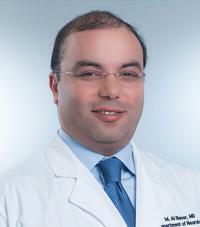 Mohammad Al Baeer, MD is board certified in neurology by the American Board of Psychiatry and Neurology and fellowship-trained in neurophysiology and electromyography (EMG) by the Houston Methodist Neurological Institute. He received his medical degree from Damascus University College of Medicine in Syria, served a residency as junior chief and chief neurology resident in neurology at Houston Methodist Neurological Institute and served an internship in internal medicine at the Huron Hospital Cleveland Clinic in Ohio. Dr. Al Baeer specializes in the diagnosis and treatment of headaches, migraines, back and neck pain, Alzheimer's disease, multiple sclerosis, epilepsy, neuropathy, Parkinson's disease and seizures.